“With more than 20 fonts and colors — even sparkling and glittery ones — you can personalize this eco-friendly bag to show the personality of each friend in your bridal party,” explains Spreadshirt CEO Jana Eggers. You can use your wedding color scheme, logo, monogram and the date of your nuptials to create a memorable and useful tote for all of your wedding guests. Or you could create fun, sassy T-shirts for your bridal party. Choose from hundreds of great designs on the company’s Web site or upload your own image. “It is also fun to have a bride-to-be wearing something flirty that starts conversations going on her big night out, whether it’s on her thong or a subdued hoodie is up to you,” continues Eggers. Even the eco-friendly will be pleased with the organic and bamboo clothing options. The tote bags are also made from natural cotton fibers. Prices are based on the cost of the product chosen, design commission and the amount of color and text. Discounts are available for large orders and standard shipping is free with a minimum $150 purchase. Designing your own tote or T-shirt is easy and the products and printing quality are amazing. It’s also a great activity to involve your (perhaps not-so-involved) fiance in the wedding planning process. 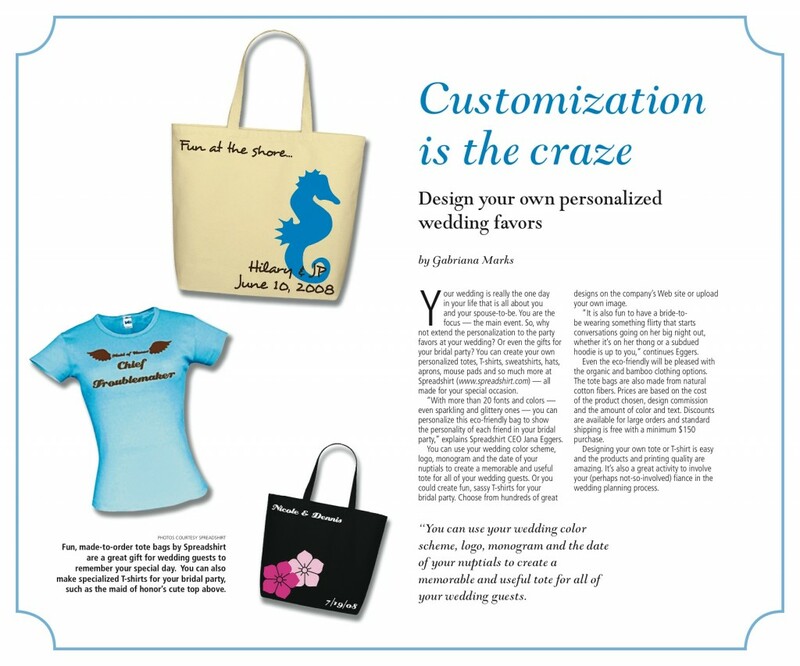 Article published in The San Fransisco Chronicle’s “Modern Bridal” custom publication in January 2008. Download PDF of original article to view full layout with PHOTOS!